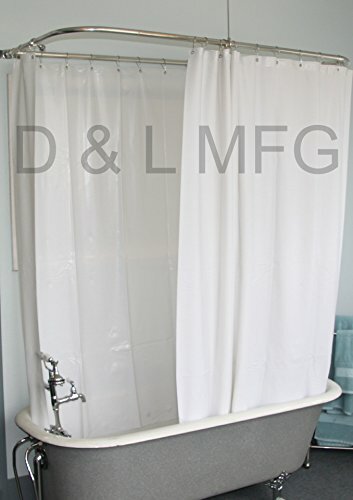 Extra Wide Vinyl Shower Curtain for a Clawfoot Tub/white Less Magnets 180" X 70"
Our clawfoot tub shower curtain measuring approximately 180" wide and 70" long with an approximate weight of 6 pounds is the perfect answer for your clawfoot tub/shower combo. 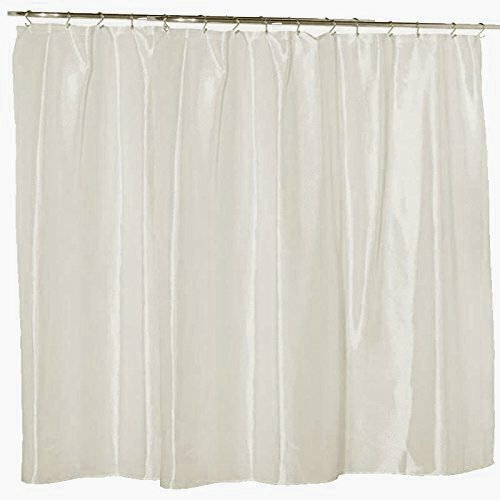 This curtain has 36 stainless grommets that can position the curtain to fit all the way around your clawfoot tub. It is solid white so it may be used as a liner or as a curtain. This is an extra large, heavy duty shower curtain compared to a standard shower curtain which typically only measures 70" wide by 72" long and weighing approximately 2 pounds. For your safety we are not able to accept shower curtain returns once the package has been opened. This liner is crystal clear, water-repellent, and features magnets at the bottom hem to provide weight and stability to keep in place. It's a perfect match for any decorative fabric shower curtain. 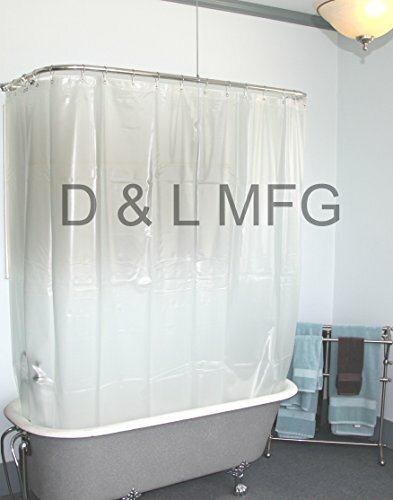 Extra Wide Vinyl Shower Curtain for a Clawfoot Tub/opaque with Magnets 180" X 70"
Our clawfoot tub shower curtain measuring approximately 180" wide and 70" long with an approximate weight of 6 pounds is the perfect answer for your clawfoot tub/shower combo. 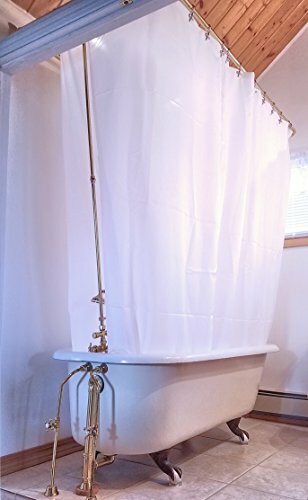 This curtain has 36 stainless grommets that can position the curtain to fit all the way around your clawfoot tub and has magnets enclosed in the bottom for added water protection. This curtain is solid white so it may be used as a liner or as a curtain. This is an extra large, heavy duty shower curtain compared to a standard shower curtain which typically only measures 70" wide by 72" long and weighing approximately 2 pounds. For your safety we are not able to accept shower curtain returns once the package has been opened. Zenna Home's NeverRust Aluminum Hoop Shaped Shower Rod is a great fit in any bathroom featuring a free-standing tub or claw foot tub. These aluminum rods are Guaranteed for Life not to rust. Unlike steel and even stainless steel – aluminum will never rust. So your shower rod will look beautiful for years to come. 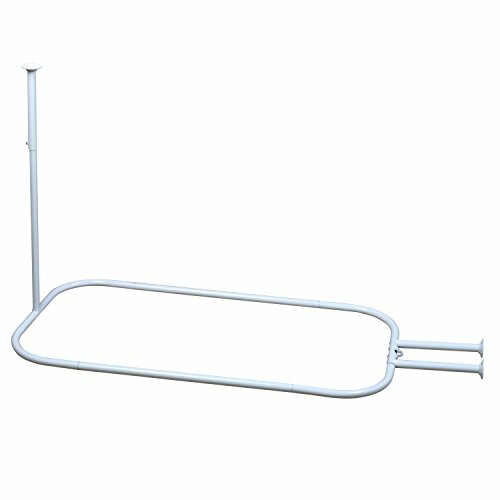 This 1-inch aluminum diameter rod is supported to the wall on one end and the ceiling on the other. The hoop rod features a chip resistant white finish. Fits tubs up to 66-inches long and 28-inches wide. Actual hoop dimensions are 47.75" x 24", and overall dimensions are 57.75" x 24" which includes the wall brackets. Step-by-step instructions are included with every rod. Zenna Home’s US-based Customer Service department is available toll-free (800-892-3986) to answer any additional questions. InterDesign's Waterproof Fabric Shower Curtain offers versatility for your bathroom. With the reliability of a fabric that is coated to repel water, it resists soaking while effectively keeping water inside the shower or bathtub. It is designed to accommodate extra-wide shower spaces and can be used as a stand-alone curtain or as a liner to coordinate with your existing shower curtain. 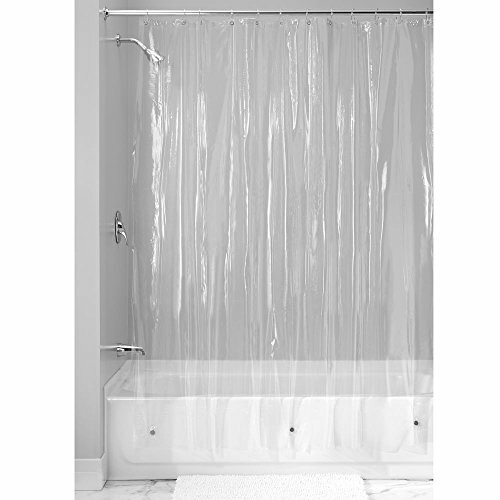 Our Claw-Foot Tub Shower Curtains are made extra wide (180" x 70") for use as a one-piece curtain to encircle the perimeter of a standard claw-foot tub. (Please measure your tub perimeter to ensure fit) These curtains are made of heavy gauge material to help alleviate the problem of "billowing & blowing" of plastic claw foot curtains & liners. The material is 100% PEVA, which is odor-free and does not off-gas like PVC curtains. This is a more healthy alternative to the PVC curtain's heavy plastic odors. The color is "Frost" which is a Semi-Transparent Opaque color which allows for light to pass through but is NOT see-through. These curtains require 30 hooks. You can purchase our 30-Hook Roller Bead packs HERE. (If using an outer decorative curtain, the "hook-holes" (grommets) may not have same spacing as other curtains). Tip: You can use scissors or a sharp razor to cut a slit so the curtain can drape over your faucet and handles. 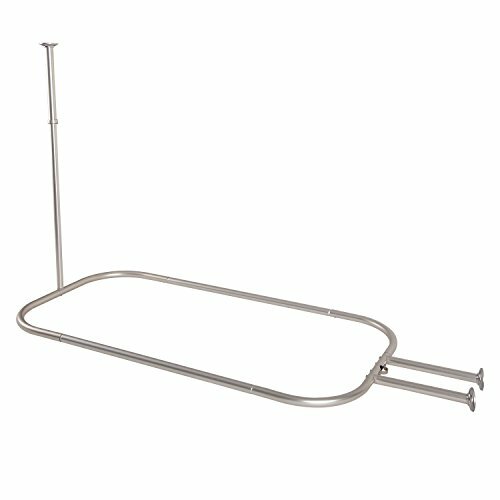 This rustproof hoop shower curtain rod is designed perfectly for your free standing or claw foot tub. Made of durable aluminum the Utopia Alley shower rod is assured not to rust and is available in 3 colors that will complement any decor. Product size (overall): 57.75" x 24" x 1" tube shower head, curtain, and hooks not included. 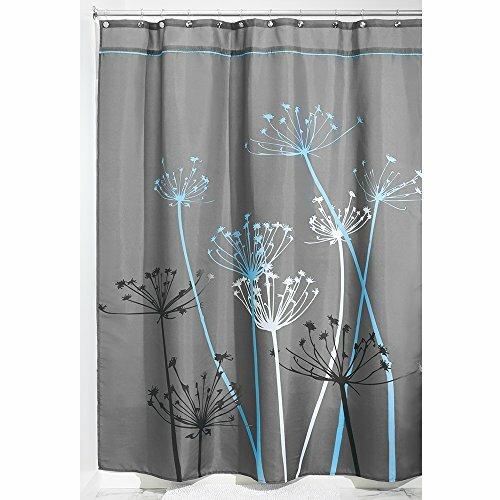 Bring in the great outdoors with InterDesign's Thistle Shower Curtain. Featuring a thistle print & 12 rust-proof metal grommets, this curtain is quick-drying & mildew resistant. Just unpackage, hang & enjoy. 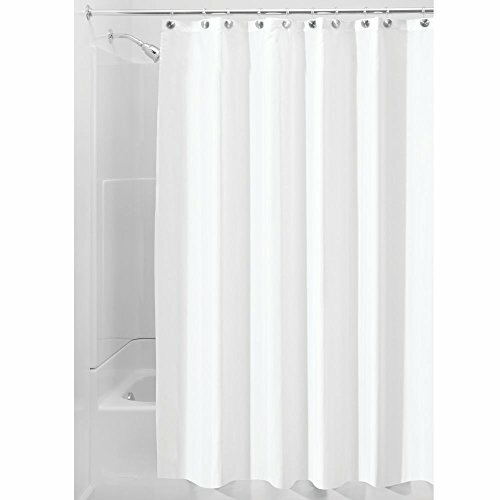 Compare prices on Claw Tub Shower Curtain at ShoppinGent.com – use promo codes and coupons for best offers and deals. Start smart buying with ShoppinGent.com right now and choose your golden price on every purchase.